Back issues of the June 19, 2014 issue of the Times-Tribune are available. 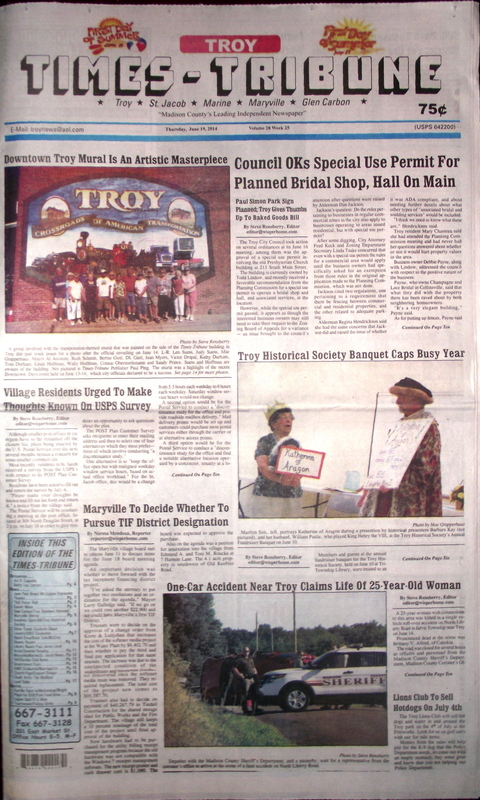 Some of the headlines in this issue: Council OKs Special Use Permit for Planned Bridal Shop and Hall, Troy Historical Society Banquet Caps Busy Year, St. Jacob Residents Urged to Complete USPS Survey, Accident Claims Life of Woman, Maryville To Decide on TIF District, Tri-Township Park To Receive Thousands from SISL, Dunstan Proposes Hiring of Advisor to Assist Treasurer, American Legion Team Starts Season With Loss; plus Triad honor rolls, police blotters, a column about driving risks, a feature on musician Paul Jarvis, and a full page of photos on the recent Downtown Days event held in Troy -- plus a whole lot more! We have obituaries for Art D. Capelle and Betty Lou Jarrett.